Meanwhile salaries just aren’t rising fast enough. As a matter of fact, we’re working just as hard or harder than 20 years ago for basically the same income while the world itself becomes more expensive to live in. If you’re thinking about how to earn more money then this is the guide you definitely want to get a hold of. A side business or side hustle or home business all have one purpose; to produce a secondary income or even a primary income that replaces our job income. Getting to that point can take an effort if you don’t have a solid idea of what direction you want to go in. 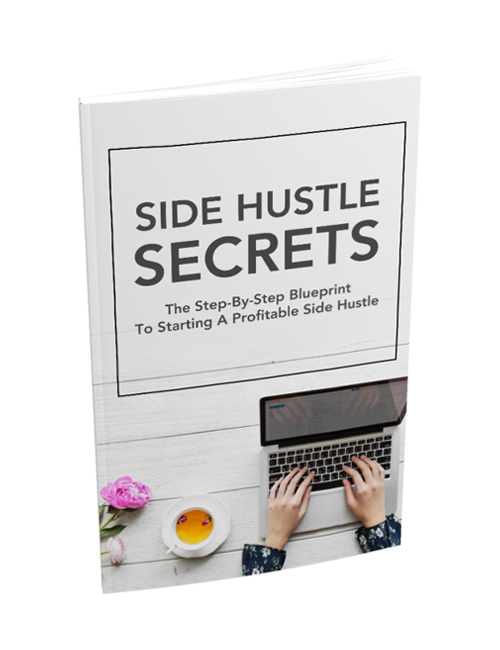 But with this guide which also comes with the Side Hustle Secrets Video Course, you will get a much better idea of what type of business you want to build and what market suits you best based on your interests. In this course, you’ll discover why you need to begin your side hustle journey, the best marketing strategies to implement, getting into the entrepreneurial mindset, how to stay focused and motivated, managing your time efficiently, strategizing for success, finding the best type of side hustle and much more. This is the guide for you if you’re finally ready to make something happen. Get it now.